Pardot, B2B marketing automation by Salesforce.com, offers a marketing automation solution that allows marketing and sales departments to create, deploy, and manage online marketing campaigns from one central platform. Together, Pardot and Salesforce.com empower every rep to act in the moment of engagement, and every marketer to drive greater results from campaigns. As an integral part of the Salesforce family, Pardot is committed to staying on the front lines of innovation, helping companies to exceed their revenue goals, better align their sales and marketing teams, and accomplish more with the resources they already have in place. Backed by the promise of one of The World’s Most Innovative Companies, Pardot customers can feel confident that they will always be on the cutting edge of marketing technology. 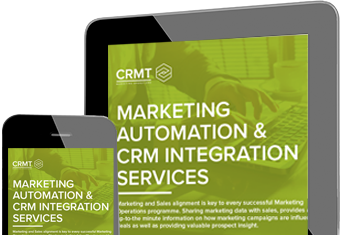 CRMT have a wealth of experience in integrating marketing automation (Eloqua, Marketo or Pardot) with CRM platforms (Salesforce.com, Microsoft CRM, Oracle).